Wow, it's been almost a full year since my last update! So this last year has been full of new and wonderful experiences working for Walt Disney Animation Studios on BOLT, which opens November 21st. Please go and see it open weekend, you won't be sorry! We're all extremely proud of the film and believe it is a big step forward for the studio - it's hilarious, exciting, sweet, and beautiful. But don't take my word for it, check out the trailer and sneak peaks HERE. For those that are curious, I've got about 50 shots in the film including 6 shots in the "TRAILER" clip , 10 shots in "THE CHASE" clip, and, well...zero shots in the "ANIMAL RESCUE" clip (but watch it anyway cuz it's still great!). Well, we're just now getting settled into our home in California. It's so crazy, there are boxes everywhere! Anyway, I wanted to let you know that The Mantis Parable is now available at Amazon.com! It's considerably better for me if folks purchase it directly from themantisparable.com, but for those that have wanted the film but are uncomfortable using paypal definitely use the Amazon site. ALSO, for those of you that have seen the film already, please stop by and leave a review on the Amazon page. Thanks! It's been a while since I posted here, but I wanted to let you know that after almost 14 years at Cyan Worlds (makers of Myst, Riven, URU) I will be leaving my day job as Art and Visual Design Director to move into animated film full-time. Last month, with work on Cyan's current project dying down for a bit I informed a select group of studios that for the right opportunity I would be available, and two weeks later I had two job offers - one from Blue Sky Studios in New York, and the other from Walt Disney Animation Studios in Burbank, CA. After much deliberation, I accepted the Disney job. I just couldn't pass up the opportunity to contribute my tiny thread to the fabric of Disney's storied animation history, particularly with the studio undergoing radical transformation under new creative head John Lasseter. At least initially I will be working in the Lighting Department, setting up the scene lighting and color to achieve the proper mood, compositing and making final visual tweaks, and working with the team of people responsible for the final visual touches to make sure every animated frame looks perfect before it hits the big screen. After receiving countless requests from teachers around the country, I have finally put up a freely downloadable "lesson plan" - available on the front page of the website. It's a simple assignment and can be easily modified for a variety of different ages and skill levels. And you don't NEED to be a teacher, it's fun for parents and kids to do together as well. Oh yeah, and thanks to teacher Larry Shurilla for his help in setting it up! Just a quick update to let you know that The Mantis Parable has won the Best Animated Short Film Award at the Beloit International Film Festival in Beloit, Wisconsin. This is the 17th award for The Mantis Parable! Woohoo! Also, last week I spent a couple days in Park City to screen The Mantis Parable at the Windrider Forum, and also got the opportunity to take in the Sundance Film Festival. What a blast! In just 2 days I saw 4 films, including the Jury Award Winner Padre Nuestro which is fantastic. Yikes! It's been almost 2 months since my last update! I'm ashamed. Actually, I've been really busy getting ready for the official launch of Myst Online: URU Live at Cyan. It's released exclusively on GameTap (where it's already available to subscribers!). In other news, I suppose I should update you on my last post regarding the 2D Or Not 2D Festival in Everett, Washington. It was a blast! The Mantis Parable screened immediately following a fantastic keynote presentation by Roy E. Disney (Director Emeritus of The Walt Disney Company and famous nephew of Walt) at the Historic Everett Theater in Everett, WA. Roy presented highlights from an enthralling history of the great, glorious and invariably ground-breaking Disney animated shorts… from "Steamboat Willie" to the studios last award-winning film, "Lorenzo"… with many a tale inbetween. It was an inspiring presentation, particularly in the way he described the future of animation. To a crowd of mostly 2D enthusiasts (of which I am one!) he commented on the sheer "stupidity" of Michael Eisner's comments regarding "2D being dead" and pledged Disney's support for future 2D feature films, while also fully supporting 3D and its unique storytelling aspects (yeah!). Basically, he described 2D and 3D as a choice specific to each and every project. YESSSS! I'm honored to announce that The Mantis Parable has been requested by the director of the 2D Or Not 2D Festival to screen immediately following a keynote presentation by Roy E. Disney (Director Emeritus of The Walt Disney Company and famous nephew of Walt) this Saturday night at 7:00pm at the Historic Everett Theater in Everett, WA. Roy will be presenting the highlights from an enthralling history of the great, glorious and invariably ground-breaking Disney animated shorts… from "Steamboat Willie" to the studios last award-winning film, "Lorenzo"… with many a tale inbetween. Too cool! The Mantis Parable has won another award, winning Best International Animated Short Film of the PIAFF in Italy! Woohoo! This is the 16th top festival award for the film. Amazing! Finally, my family and I went to the IMAX yesterday and saw a wonderful (and educational) film about insects titled BUGS: A Rainforest Adventure. We all loved it - amazing footage of mantises, caterpillars, butterflies, all sorts of amazing insects. If you've got an IMAX theater in your area, it's really worth the trip. Long time no post! Sorry! I've had to work out a bunch of kinks with my new hosting service so I haven't wanted to update anything in case my changes didn't "stick." So this past weekend I spent a few days in LA at the Los Angeles International Children's Film Festival and had a wonderful time. It was GREAT to meet a bunch of other filmmakers (you know who you are) and I saw several wonderful films. Special thanks to Dan Bennett for his generous work with the festival, and for securing such a great venue (the Los Angeles County Museum of Art). The Mantis Parable had a fantastic screening on in front of a large very enthusiastic crowd. Awesome! First of all, I'm thrilled to be receiving your kind messages regarding the film - it's so nice to be able to share it with you! For those of you who haven't ordered a copy of the DVD, what are you waiting for? ;) Simply click on the "Get the DVD" link in the top right corner of any page on this site to access the Mantis Shop page. I'm working to move over all of my web stuff to a different host to avoid such problems but it may take a couple days to get it sorted out. Until then, I'm just keeping my fingers crossed that everything will hold together reasonably well...it feels like my entire online world is being held together by chewing gum and popsicle sticks right now, and it's all out of my control. I don't like things that are out of my control. Aargh! Finally, the time has come - THE MANTIS PARABLE SPECIAL EDITION DVD IS NOW AVAILABLE!!! Simply click on the "Get the DVD" link in the top right corner of any page on this site to access the Mantis Shop page. This professionally replicated DVD contains the 8 minute film (NTSC* / 1.85:1 / Stereo), 3 Director's Commentaries (1 Creative and 2 Technical), 17 Making Of "Featurettes" including WIP images and clips from the film, and more! The DVD is just $15 USD**, and is currently only available at the Official Mantis Parable Website. Also available is an 11x17 Poster for just $5 USD, which I will personally sign before shipping unless you request otherwise. *The Mantis Parable Special Edition DVD is a professionally replicated region 0 NTSC DVD which will play on both NTSC and PAL players. Click HERE for more info. **All purchases are handled by PayPal - however you don't need a PayPal account, just a credit card. Please EMAIL me if you have any questions. 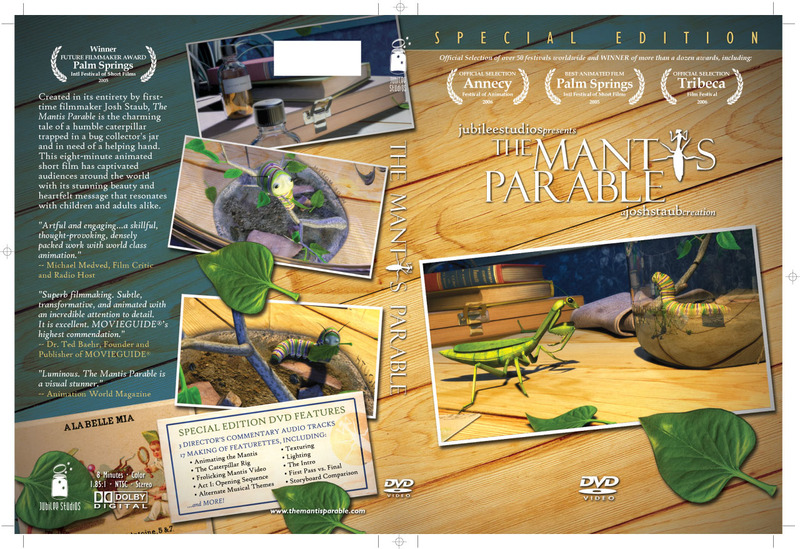 THE MANTIS PARABLE SPECIAL EDITION DVD will be available sometime this week! The DVDs have arrived, I'm just waiting for the packaging materials so I can ship orders out. Woohoo! In other news, The Mantis Parable won its 15th award this past week taking BEST ANIMATED SHORT FILM at the Tahoe-Reno International Film Festival. Awesome! Thanks T-RIFF! Also, in a little bit of housecleaning, I've put every production journal entry "PRE-2006" on a new archive page which can be accessed via the little "a" with the circle around it next to the production journal link. This should make the current production journal page (the one you're reading) load faster. Let me know if you have any trouble. 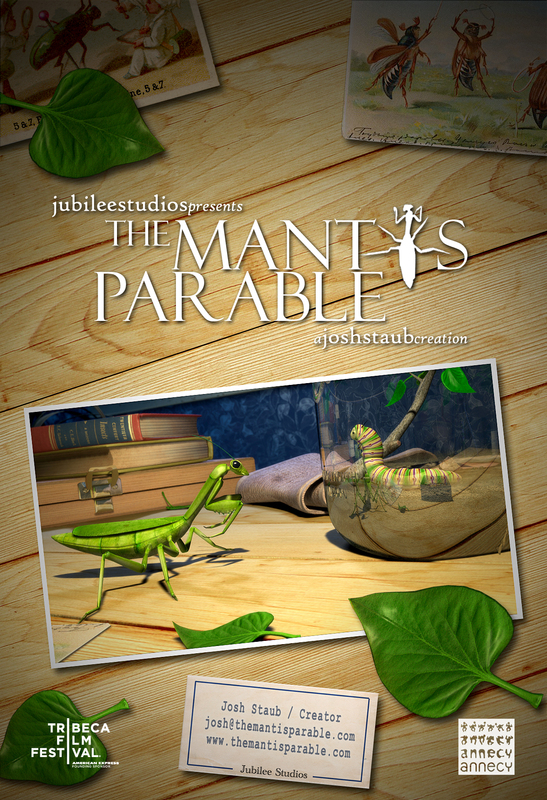 THE MANTIS PARABLE is NOW AVAILABLE for VIEWING on iTUNES! In addition to The Mantis Parable, this shortlist of award-winning animated shorts available for viewing includes John Canemaker's Academy Award winner The Moon and the Son, academy nominee and Annecy favorite The Mysterious Explorations of Jasper Morello, and legendary animator Bill Plympton's The Fan and the Flower. BTW, The Mantis Parable Special Edition DVD is currently being replicated and should be available for purchase in about a week! Okay, so the BIG, FAT, EXCITING NEWS hasn't happened quite yet...should be any minute now! Also, The Mantis Parable has a myspace page! Check it OUT! THE MANTIS PARABLE SPECIAL EDITION DVD coming end of August! The Special Edition DVD will include 3 director commentaries, 17 making-of featurettes with never before seen "work-in-progress" footage, never before "heard" alternate music themes, and more! Stay tuned for more information VERY SOON! Last weekend I attended the Festival of Visual Effects where The Mantis Parable screened in Hollywood at the Egyptian Theater. It was a wonderful weekend filled with lots of insightful panels and great speakers, many of whom I was able to chat with, including Dennis Muren who I had previously met at the Hollywood Film Festival last fall, and Tim Johnson, the director of Over the Hedge. The final night of the festival included a preview screening of Monster House, the upcoming animated feature film by Sony Imageworks which I really enjoyed. It's a bit too scary for little kids, but a lot of fun for older ones (and big kids like me). All in all, a great trip! ...A couple days ago I got word that The Mantis Parable won the award for BEST SHORT FILM at the Solstice Film Festival. Cool! ...TMP will be screening TONIGHT in Austin, TX at Screen Door Film. It's screening in a program of 5 shorts including a really hilarious short film I saw at Tribeca called K-7 and the cost is only 5 bucks. If you live in the Austin area, you've gotta go! ...TMP will be screening at the Smithsonian Institute Hirshhorn Museum next Thursday night, July 6th! ...TMP will be screening in a program put together by Animation World Network at the Festival of Visual Effects for the Visual Effects Society next week. It screens every day for the length of the festival (July 6th - 8th) at the Egyptian Theater in Hollywood, CA. I'm starting to find out more specifics about The Mantis Parable screenings at the museums, so I've added them to the list on the screenings page - stay tuned for all the details! The Smithsonian had such a wonderful screening of TMP that they've asked to screen it again this summer - stay tuned! First MoMA, then the National Gallery of Art, now...the Smithsonian! Wow! What an amazing year this has been - as of this weekend The Mantis Parable will have spent a year on the festival circuit. Hard to believe that one year ago the film was about to make its World Premiere at the Seattle International Film Festival! Amazing! Since it's premiere The Mantis Parable has screened in over 40 festivals around the world (many of the world's finest, and 11 of them Academy Award qualifying fests), won more than a dozen top awards, qualified for Oscar nomination consideration (TWICE! )...and its run appears far from over! Just take a look at the month of June and you'll find TMP screening in at least 6 more festivals, with several more on the horizon, not to mention screenings at both the Museum of Modern Art (MoMA requested a copy of the film for the permanent MoMA archive), as well as the National Gallery of Art in the coming months. Woohoo! Yikes, it's been a while since my last post. Sorry! Meanwhile, The Mantis Parable continues to receive invitations to festivals and is screening all over the place...most recently being invited to the Jackson Hole Film Festival which takes place in quite possibly the most beautiful spot in the United States. Woohoo! Returned home from a wonderful trip to Florida for the Florida Film Festival this past weekend - a trip that can only be described as very short, but very sweet! :) Got the opportunity to hang out with some great filmmaker/animators, including the legendary Bill Plympton, director of the beautiful animated short (but very "un-plympton-like") The Fan and the Flower. Special thanks to Dominic, Gregg, Paulo, and John who basically adopted me on Friday night after a long day of flying, and to David Meyers for the great conversation(s). All in all, a great trip. Amazing! The Mantis Parable has been officially selected to screen at Annecy, THE top animated film festival in the world! Seriously, Annecy (which is in France) is considered the "Cannes Film Festival" of the animation world, and I'm thrilled to have TMP participate. More details to come. WOOHOO! 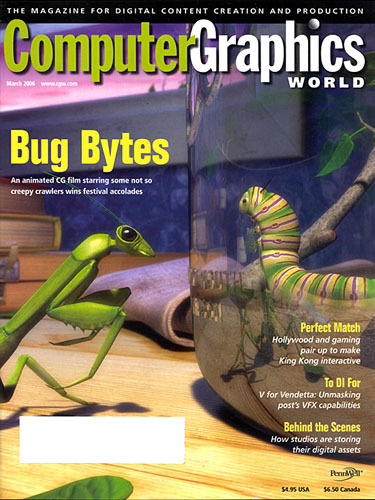 The Mantis Parable is the featured article in the March issue of the popular computer graphics magazine Computer Graphics World.I had heard there was a chance it might make the cover, but I wasn't sure until today when I received my copy! UPDATE (3/21/06): HERE is a direct link to the article. In 2002, the Tribeca Film Institute successfully launched the First Annual Tribeca Film Festival. Created by Jane Rosenthal and Robert De Niro, the mission of the Tribeca Film Festival is to enable the international film community and the general public to experience the power of film by redefining the film festival experience. The Tribeca Film Festival was founded to celebrate New York City as a major filmmaking center and to contribute to the long-term recovery of lower Manhattan. The Tribeca Film Festival brings more than 300,000 people downtown and in excess of $50 million to the local economy. 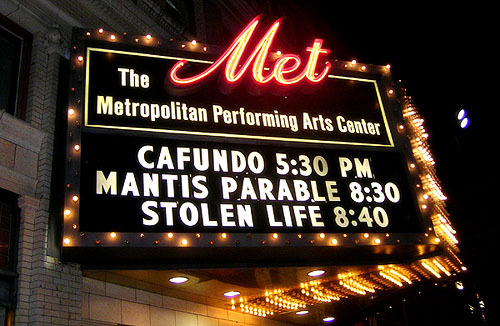 Ever seen a short-film receive its own spot on a theater marquee? Well, apparently The Mantis Parable was such a draw at my hometown Spokane International Film Festival, that on closing night they chose to put TMP on the marquee outside! Check it OUT! As you can see, The Mantis Parable was paired with the wonderful Chinese film Stolen Life (winner of Best Narrative Feature Film at last year's Tribeca Film Festival). The Mantis Parable train just keeps chuggin, folks! Oh yeah, and again, I've had to temporarily lock-up the guestbook due to massive spamming,,,but please don't be a stranger! Drop me an email at josh@themantisparable.com. Screened last night at the beautiful Met for the Spokane International Film Festival. There was a wonderful crowd and everyone seemed to really enjoy the film. Looking forward to closing night of the festival next Thursday where TMP screens again. Don't miss it! Tomorrow I'm off to the Santa Barbara International Film Festival where TMP screens on Sunday evening AND Tuesday afternoon. Tuesday evening I'll be screening at the Cinema Society of San Diego as well. Should be a great trip! This Sunday, I'm off to the Santa Barbara International Film Festival, where TMP screens on Sunday evening AND Tuesday afternoon. Unfortunately, I may be unable to catch the Tuesday screening in Santa Barbara because I have a prior engagement with the Cinema Society of San Diego which will be screening TMP at the Sherwood Auditorium in the the Museum of Contemporary Art that evening. I've also learned that TMP has received a Director's Choice Award at the Black Maria Film Festival (TMP's 9th Academy qualifying festival acceptance!). It's a festival explosion! 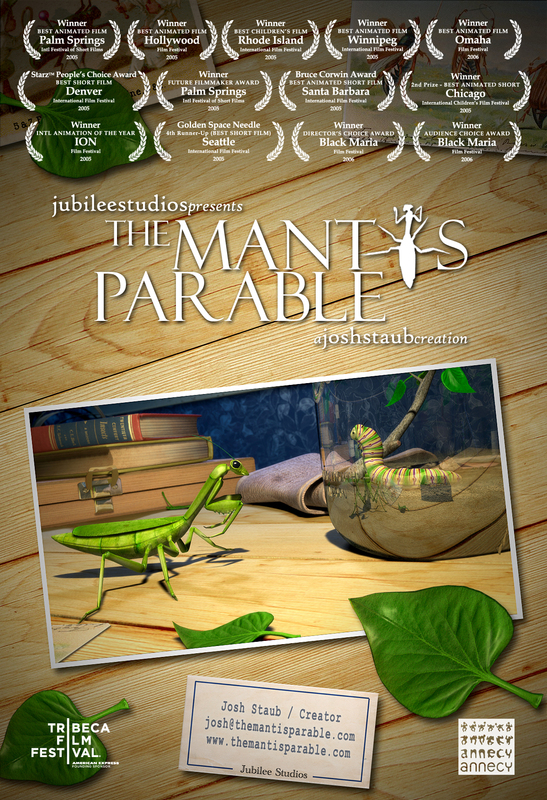 Check out the screenings page to find out if The Mantis Parable will be screening near you! :) Added this week are 2 more Academy qualifying film festivals, the Santa Barbara International Film Festival in early February and the Florida Film Festival in late March. "With more than 650 works in 2005, the IMAGINA AWARDS remain the unchallenged spearhead of international digital creation. For almost a quarter of a century, the IMAGINA AWARDS have recognised the genius of artists, directors and students." A couple months ago, the Starz Denver IFF short curator asked if she could submit TMP to Frontier Airlines to be shown on flights during the month of January. I told her that sounded like a really cool opportunity - I didn't realize this at the time of the request, but it's actually part of the Cloud 9 Film Festival. I've been extremely cautious with regards to screening TMP on the internet due to festival conflicts/regulations, so you can't watch the film on the website (only in the AIR - so fly Frontier! ), but you CAN view the other films and you CAN vote - once per day in fact (!). This goes without saying, but if you've SEEN The Mantis Parable, would you be so kind as to go view the films and VOTE for your favorite? Lots of things going on right now. Next month, The Mantis Parable will screen at the Cinema Society of San Diego as part of "An Evening of Award Winning Short Films" on Tuesday, February 7th at the Sherwood Auditorium in the the Museum of Contemporary Art, San Diego, CA. This roughly coincides with TMP screening at the Spokane International Film Festival but I'm going to do my best to make it to all the screenings (!) Additionally, TMP has been invited to screen at the National Gallery of Art in Washington D.C. this summer. Stay tuned for more details!